The first Mapalo graduate to enter university is now a Northrise student! At age 17, Brian Musentekwa feels very blessed to be a student at Northrise. Progression beyond high school is limited for the majority of Zambian students and even more challenging for individuals in economic circumstances like Brian’s. Brian lives with his mum, dad and five siblings in Ndola’s Mapalo compound. His dad works a casual job at an air force base a little distance from their home. Their community has widespread economic deprivation and limited access to education, health, and social facilities. When Ndola City was a vibrant industrial base, Mapalo’s residents provided the casual labor force in companies and elite households. Recently, most industries connected to copper mining and refineries have collapsed and Copperbelt compounds like Mapalo are riddled with unemployment, crime and social vices such as alcohol and drug abuse. The state of physical, social, and spiritual poverty moved Pastor Emil Mukuka, a Northrise University graduate, to establish a community school in Mapalo compound. Since inception, Mapalo Morning Glow Academy has worked with the local community to encourage parents and guardians to send their children to school. Mapalo focuses on a long-term holistic poverty alleviation strategy. Therefore, the academy fundraises to subsidize fees and a feeding program. Most of all, Mapalo provides spiritual guidance for the pupils. Brian Musentekwa, now an NU first year student, is a testimony of God’s blessing the interventional efforts of Mapalo Morning Glow Academy. 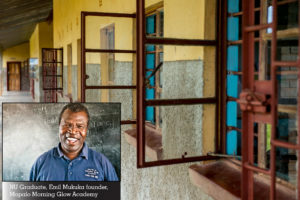 Brian started his primary education at Mapalo Morning Glow Academy at age 7, because his parents could not afford to enroll him in a mainstream state school. Little did they know that this misfortune was to be a blessing in disguise! Mapalo Academy, a community school for the underprivileged, performs better than most state schools in the area and Brian’s experience at Mapalo Academy was a positive one. He received the academic support and spiritual nurturing he needed. Brian transitioned through the secondary level at two other schools and did very well. Consequently, Brian continued to receive financial and pastoral support from Mapalo Academy. This connection kept him in touch with his roots and all the developments at the Academy. Through this continuing relationship Brian learned about Northrise University, its culture of service, Christian ethos and academic excellence. While in secondary school, Brian developed an interest in bookkeeping. Since then, his desire has been to attend Northrise University and become an accountant. Pastor Emil helped Brian with the process of enrolling at NU. Halfway into his first semester, Brian says of Northrise, “I like the social interaction at Northrise, Student Life programs, Chapel and Bible study. Chapel and Bible study sessions are helping me to keep on the right path. In a way, NU feels like the atmosphere I enjoyed at Mapalo.” He is determined to succeed at NU and become an accountant. Most importantly, to become a good man who is able to help other people. The partnership between Northrise University and Mapalo Morning Glow Academy is growing and is sure to make more dreams come true for students like Brian. From a relationship that started with Pastor Emil joining Northrise as a Theology student, new opportunities have developed over the years for the benefit of both schools. The Mapalo Academy and surrounding community serve as a ministry base for the Impact Ndola Program hosted by Northrise every two years. As a result of the success of Impact Ndola, Pastor Emil also opened Mapalo to Northrise students for their weekly Service Learning activities. Northrise students have an opportunity to engage in community work and be inspired by the altruistic achievements of an NU graduate. Student interactions provide invaluable mutual benefits. Northrise students learn to serve others and Mapalo students receive the blessing of encouragement, educational and social support and the inspiration to dream. 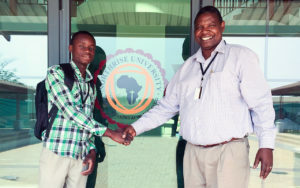 Most significantly, Brian Musentekwa, Mapalo’s first graduate to attend a university, is a testimony of what God is doing in Zambia and the way He is using Northrise to transform Zambia, one student at a time.